Most people have to wait until Independence Day or New Year's to see a fireworks show. 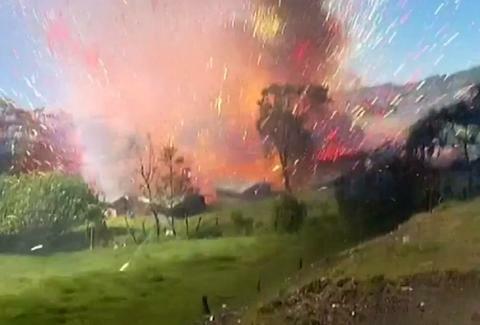 But the lucky (or, for bystanders, unlucky) people of Bogotá, Colombia got a public pyrotechnic party on Sunday when an explosion at a fireworks factory sent colors and sparks streaming through the sky. The ground-shaking blast -- captured on video -- was so great, it literally swept a cameraman off his feet, and reportedly injured two people. Officials are investigating the incident, but chances are whoever was responsible is getting fired. And likely, with little fanfare. Or fireworks, since they're all gone. Seriously, try not to cringe as you watch the video below.